In the first two articles of this series on how to write a training outline, I covered the six steps you should follow to make sure your training is well organized and complete. In this final part of the series, I present how my leadership training outline might look as a fully developed training outline. When you go through the six steps, you would jot down your ideas and revise them as you go along, but then assemble everything at the end into a document that looks like the one below. In this leadership training example, I’m seeing it as an ongoing series of half-day workshops, and what’s presented below is just one objective of several that would make up an opening session of a multi-part series. The outline below covers a two-hour period of time. If I were running this leadership training at a company knowing the audience is made up of mid-level managers, each session would probably be 3 hours with a short break at the half-way point. In the example training outline above, the material presented covers about two hours of time. With a 15-minute break, that would only leave another 45 minutes of training time, which means I would either try to include one more very simple objective that could be covered in that time, or expand the content of the Define Leadership objective to take up the whole session, either by adding another interesting and engaging activity or including a few more example definitions of leadership. 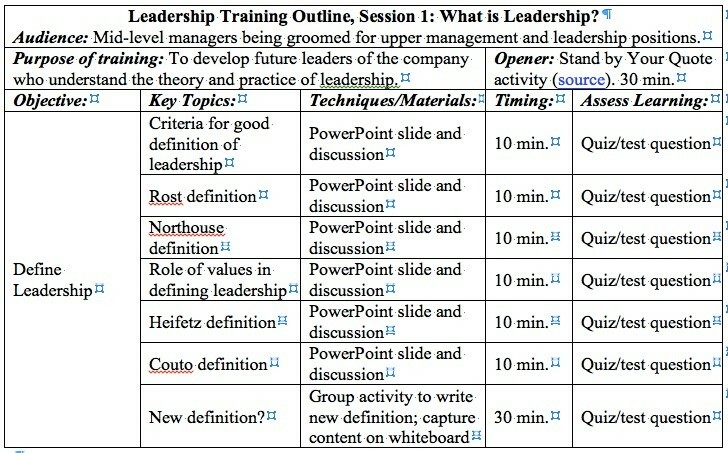 Of course, everyone knows organizing a leadership training with any level management can be challenging. See how you can to host an effective training meeting. Step 1: The basics. Who is your audience? What is the broadly defined topic you need to cover? Step 2: Define your training/learning objectives. What exactly do you need people to know or be able to do by the end of the training? Step 3: Purpose and Opening. Why is it important for people to take this training? What will you do to capture their attention and get them engaged right from the start? Step 4: Clarify key topics, related concepts, and timing. Step 5: Presentation techniques and materials. How will you present the content and what materials do you need? Step 6: Evaluation, assessment, reflection. How will you determine if participants have learned what they need to know? How will you find out if participants thought the training was effective and enjoyable? How will you learn lessons from this training that can be applied to future trainings? 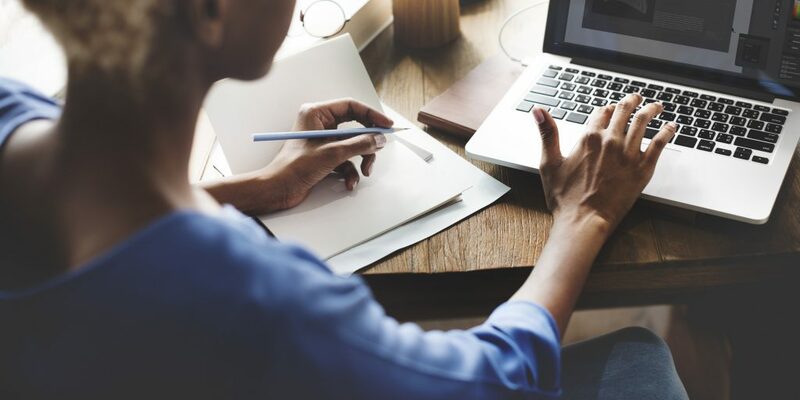 By following this six-step process, you’ll be well on your way to creating more effective, well-organized trainings that deliver the content you need participants to learn.